#400 | American Holtzkraft, Inc.
Northeast American hardwoods, cut and shaped along simple functional lines of the Pennsylvania Dutch, translate into comfort and durability in these benches and chairs. Oak so responsive to the craftsman’s hand, resists water and weather under several coats of marine varnish. Distinctive hardwood grains (mostly oak) are preserved by slow kiln drying, sealing and a slow drying of multiple natural or wood toning finishes. Multiple coats of marine varnish increase weather and water resistance. Tongue-and-groove bench assembly; enhanced Shaker chair design and Pennsylvania Dutch dovetail construction. 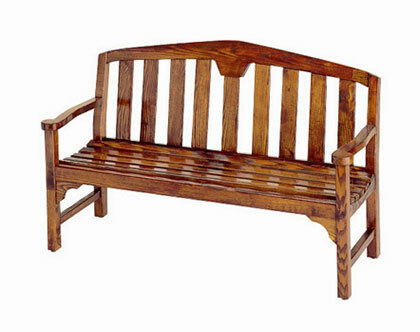 Slat-back bench and solid wood chair are contoured for extra comfort. g. Natural or wood toning finishes.